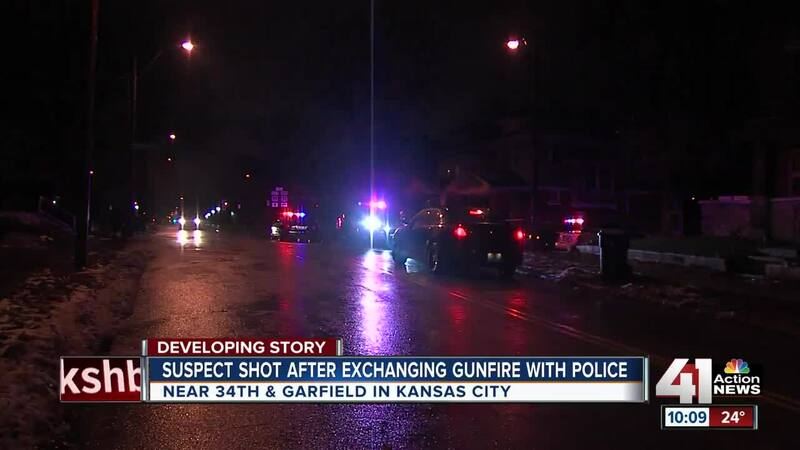 A suspect was shot by Kansas City police Monday evening after a traffic stop. KANSAS CITY, Mo. — A suspect was shot by Kansas City police Tuesday evening after a traffic stop. The man was arrested by KCPD and taken by ambulance to an area hospital. KCPD Officer Darrin Snapp said two officers attempted to pull over a vehicle at about 6:15 p.m. near 34th and Brooklyn but it fled. The vehicle wrecked near 34th and Garfield and the suspect got out and ran. The man fired at officers during the chase. Police returned fire and struck the suspect. "With so many guns out on the streets, nothing's routine anymore," Snapp said. The suspect is in serious but stable condition. He was shot in the ankle. Investigators don't yet know why the man ran from officers. "We just know that he definitely had a gun and wanted to kill a police officer," Snapp said.